Bluefin LED’s new Piranha P12 underwater lights are super bright, with an incredible 5500 fixture lumen output. They are ultra compact and very low profile, making them ideal for boats of all sizes. The new Piranha P12 lights are also extremely versatile. 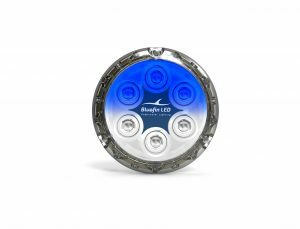 Owners can choose blue or white underwater lighting or a combination of both — and activate the light’s strobing function — using just a single toggle switch. With a built-in driver and needing just three mounting holes and a small cable entry hole, the P12 lights are incredibly quick and easy to install. The lights are available in single or dual colour (cobalt blue, sapphire blue, white or white/blue), operate on 12V or 24V, are suitable for transom or side of hull mounting and can be used both in and out of the water thanks to Bluefin LED’s clever Active Thermal Rollback Protection. The new Bluefin LED Piranha P12 underwater lights are now available nationwide through Lusty and Blundell’s network of leading marine dealers.